zCover Inc, the leading manufacturer of fashionable silicone protective cases, has announced today the release of their Dvorak keyboard cover. Designed for Mac, the Dvorak keyboard cover transforms a standard Apple Keyboard layout so that it corresponds to the Dvorak setting. This break through for Dvorak users allows one to finally have an inexpensive and practical Dvorak keyboard. In the 1930s Dr. August Dvorak developed the alternative to the standard QWERTY layout, the standard we still use today. However not being the standard in the industry, the Dvorak layout is considered the superior layout by ergonomic experts and practitioners. While it is as easy as changing your keyboard setting to respond to Dvorak by simply changing your preferences on your computer, the problem that still exist is that your keyboard does not match, the zCover Dvorak keyboard cover solves this problem. Constructed from zCover's high- quality silicone, the cover provides protection against contamination while also molding perfectly to your apple keyboard. Seemingly feeling like it belongs the cover feels part of the keyboard rather then an after market attachment. Versatility of the cover allows for it to be attached or transferred between keyboards in seconds, it can be removed just as easily and can be washed for easy cleaning. "It took us years to develop printing technology for our silicone covers. zPrinting is one of our key business. The Dvorak users can now also use the rewards of the zPrinting covers. The printings are blended to our moldings by our specially designed technique giving the labels their permanence. B eing extraordinary durable and a perfect fit they win lasting affection and loyalty," said Sean Sa, vice president of zCover Inc. 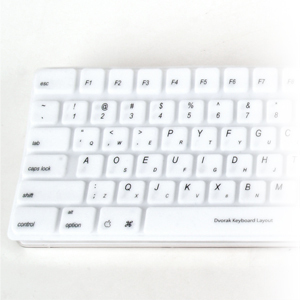 The zPrinting Dvorak Keyboard Cover fits Apple Keyboard & Apple Wireless Keyboard.